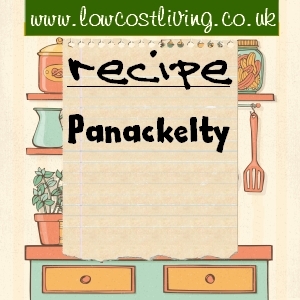 This quick and very easy panackelty recipe makes a filling and tasty meal for 4 people. It’s not expensive either. A traditional frugal dish. We find keeping a tin of corned beef in the cupboard for this recipe helps for those end of week meals when running low on everything else bar a few vegetables. Layer the onions, corned beef, carrots and potatoes in an oven proof casserole dish, finishing with a top layer of potatoes. Pour over the oxo stock. Cook in the oven, gas mark 5, 190°C for an hour to an hour and a quarter, until the potatoes are cooked. Tasty and filling. Serve with green vegetables, broccoli, or maybe even a salad on warmer evenings. Thanks for recipe will try tell u how we like it,, heard of it from a friend in S Africa. Super simple recipe, I cannot believe how tasty it was, Thanks! Will be a regular meal in our house now! This is our Middlesborough version. Cut bacon and onion and gently fry in the pan. Eventually a layer of thin potato slices. Then a layer of corn beef slices. Beef gravy, quite thin; and gently cooked on hob. Uncovered frying pan. Never seen a good illustration of this meal and NEVER heard of batter being poured on. Like lasagne – no limit on quality. Using dumpling mixture. Mix then lay out on a tray flatten until one inch thick then cut into 3 or 4 inch squares place in hot oven until risen. Test with rod through middle that they are cooked and serve with panackelty. In oven about 190c gas mark 5 375f Enjoy! Has anyone done this recipe in a slow cooker? My mum used to make it with potatoes, bacon, sausage and black pudding also with onions. Very nice. This recipe has been handed down in the family since my great grandmother. Layers of potato sliced, Corned beef, cabbage, tomatoes, celery and start again. Chicken oxo cube with tomato sauce added to the stock. Finish with sliced potatoes on top, in an oven for two hours and served with crusty white bread and butter. Yummy. We used to love panackelty nights when I was a kid in fifties Middlesbrough. It’s interesting to see all the different versions here but it does seem to be a north east dish. The name is interesting and I wonder if it comes from the Northumberland dish called Pan Hagherty which is a similar type of stew or casserole. I am going to try the bacon version posted by William that looks like an interesting added touch. We always poured malt vinegar over ours when it was cooked. Does anyone else do that?